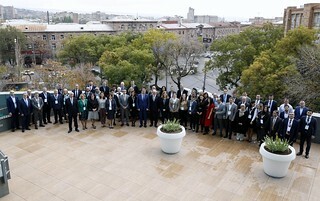 Over 60 delegates from 16 countries, international and regional organisations, business, civil society and academia gathered in Armenia for the latest in a series of regional meetings. These events offer participants from different regions in the world the opportunity to provide their views and input into the Inclusive Framework on BEPS from a regional perspective and in a regional setting. The event was hosted by the State Revenue Committee of the Republic of Armenia in co-operation with the OECD and the Intra-European Organisation of Tax Administrations (IOTA). Opened by the Chairman of the State Revenue Committee of Armenia, Mr. Davit Ananyan, the meeting was co-chaired by Ms. Nairuhi Avetisyan, Head of the Transfer Pricing and International Projects Division, State Revenue Committee of Armenia, and Mr. Wolfgang Büttner, Technical Taxation Expert at IOTA. Furthermore, the meeting gave an update on the transfer pricing follow-up work and the development of toolkits to support low-income countries. Participants discussed the range of capacity-building initiatives to strengthen countries’ tax systems and administration including the joint OECD/UN initative Tax Inspectors Without Borders (TIWB). Participants included senior officials from ministries of finance and tax administrations from Armenia, Belarus, Bulgaria, Croatia, Czech Republic, Estonia, Former Yugoslav Republic of Macedonia (FYROM), Georgia, Hungary, Italy, Kuwait, Latvia, Oman, Poland, Romania and the Slovak Republic, as well as representatives from the British Embassy, the Eurasian Economic Commission, GIZ, the National Assembly of the Republic of Armenia, from the private sector (Association of Accountants and Auditors of Armenia, BDO Armenia, Grant Thornton, Ernst & Young and PwC Armenia), from civil society (Taxpayers Rights Protection Organisation) and academia (Yerevan State University).